Our long day of travelling resulted in getting an overnight sleeper train from Vilnius to St Petersburg. Our cabin was awesome, like a Victorian carriage or something from the Titanic. It was a four bed cabin but only booked out to us which was great. We were woken in the middle of the night at the border crossing for them to stamp our passport and then check (several times) that we weren’t hiding stowaways in our cabin! We checked into our hostel which is so cute and homey. The beds are little dens in the wall with curtains! We headed out to the Winter Palace/Hermitage which is overpoweringly huge and beautiful. Getting in was an experience in itself as there is no concept of queuing, people actually push and shove to get past you! Inside was incredible decor. 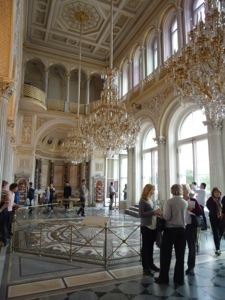 The Hermitage is huge, second only to the Louvre, and spending 1 minute looking at each article would take you 8 years. It has 1,057 rooms! Here is palace square, twice the size of Red Square in Moscow and the place of ‘Bloody Sunday,’ the massacre of protestors in 1905. St Petersburg’s beauty is due to its little change in the Soviet era, alot of the buildings untouched or restored to previous grandeur. There is little to acknowledge last 100 years, with little mention of the wars, playing host to revolution, Bolshevism or the USSR, a very different approach to Berlin! At night we made pasta and met some nice people, lots of Brazilians around and a great atmosphere. We also met someone who had been on our walking tour in Warsaw! We set out to discover more of the city. There is a lot of orthodox churches around. The three main ones are all equally beautiful but very different in style. Nevsky Prospekt is the Main Street in Russia, a hive of activity and beautiful buildings. The street is huge with 8 lanes of traffic travelling up the Main Street, difficult to cross! 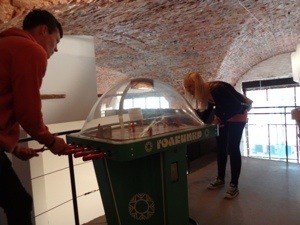 Just off this street we found one of the strangest museums, a museum of soviet arcade games from the 70’s. 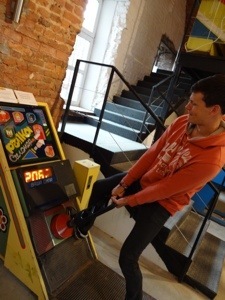 For about £6 we got 15 coins to go and play all these strange russian games. In the evening our hostel was hosting a free cooking class on how to make Borsch- a russian soup. It is made with a lot of vegetables and we also made garlic bread and washed it down with a shot of Vodka. With our new English, Fellow Trans-Siberian travelling friend, Tara, we went out to see the opening of the bridges which happens between 1:15-4:15 every night to allow the ships down the river. The river was so beautiful illuminated at night and every building lining its banks is huge and grand. At breakfast one of the staff made a round of waffles for everyone and a group of us sat round having a nice breakfast. We headed to Peter and Paul’s fortress, the first settlement of the city of St Petersburg. The city is on the river Neva and is actually made up of 44 islands. 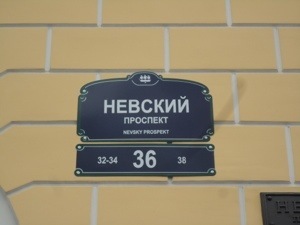 Peter the great, a Romanov, wanted to move the capital from Moscow however the settlement of St Petersburg was not where he originally planned. In 1700 he declared war on Sweden and the Russian boats occupied the entire Neva river. He founded a port called Sankt Peter Burkh after his patron saint however after his victory in the war with Sweden he founded the city. The fortress has had many uses as a prison, a mint and used by the admiralty. Next stop, overnight train to Moscow!